How to make Indian Bhuna Masala? Bhuna Masala is the most basic step in most indian food , you can call it the soffritto of Indian Cuisine – whether it be a chicken curry or a vegetarian sabzi.Almost every dish starts with this.This is the first step towards making a fantastic curry. 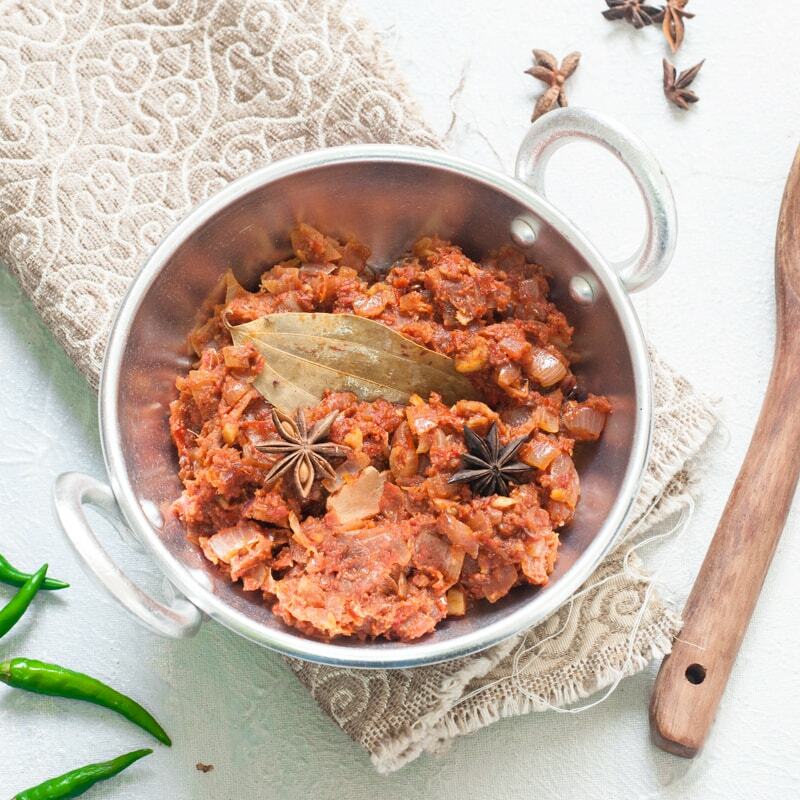 “Bhuna” literally translates to “Roast”.The onions and tomatoes are roasted together along with a few choice spices to create a base for all Indian sauces.Mastering this is mastering Indian Cuisine. With this ready in my fridge, I can make curries on the fly! In fact, the lazy bum in me just adds a couple eggs to it to make a very fast Egg Bhurji without compromising on the flavour.The real clincher here though is – that it freezes really well.So just spoon it into a zip lock bag, write the date, pop it in the freezer and forget all your curry woes!! This masala is akin to soffritto used in Spanish,italian,portughese and Latin American cooking- the base used for all sauces.Similarly this Indian Bhuna Masala is the base to all curries. This Bhuna Masala recipe is my goto way of making the base sauce but It’s not the only way.You can change the texture and taste by altering the size and cut of the onions and tomatoes.If you add an onion paste instead of the chopped onion – the masala will be very different from this.Similarly if you puree everything and dump in the Kadhai, it will be a very different masala. A bhuna Masala like all sauce bases needs love and care.You cannot rush it.You should not rush it.It needs a patient and a loving hand.The slower you cook this, the better the results. The proof of a good bhuna masala though lies in it’s jammy consistency and concentrated flavour – The onions should be medium brown- by that I mean some of the onions should have brown caramelisation but not be burnt! It’s a delicate balance really! The bhuna masala you see in the picture is what I used to make Dal Tadka,Rajma Masala, my mothers paneer capsicum and my chicken curries. At one point I used to eat this along with Maggi and Chips.Lol. How to make Indian Bhuna Masala - Recipe to make the base for all Indian Sauces.It's easily Freezable and a great shortcut. When its hot, add Jeera and let it splutter.Add Bay leaf, cloves and Star Anise if using. Add the chopped onions and saute till they are medium brown.Takes about 10 minutes. To the onions, Add the spice powders- Coriander powder, Garam Masala and Chilli Powder.Roast the masala for about 30 seconds. Bhuno or cook the masala till the water evaporates and the masala looks solidish and the smell of raw tomato goes away.This step takes about 10-15 minutes. Use as required in Curries and Sabzis. The curries in which this masala can be used!